Thanks to a friend for putting us in touch with some lovely farmers, my partner and I have spent the last two sundays out chasing turkeys around on their land. Our first trip out we didn't have much success, but we weren't expecting to go out hunting, we were only wanting to go and introduce ourselves to them, we ended up seeing a fair few out in the paddocks and we were able to get ourselves fairly familiar with some of the property. We were able to get a shot off at one as it was passing through the fence but the arrow ended up hitting the fencepost and breaking. The next shot hit the same one but bounced right off the tail feathers, it was just after this that we ended up losing an arrow in one of the paddocks and had to stop for the day. We had spent a good half an hour to forty-five minutes looking for the arrow not wanting to leave it behind in their paddock, but they waved our concerns off and told us not to worry about it. We headed out again today, fairly determined to catch one. We came across the first mob fairly quickly as they were right in the front of the property but decided to leave them be as they had chicks with them. The next lot we came across were roosted on a fallen tree and my partner was able to get a shot off at one. He was able to hit the turkey but it wasn't that easy. It took off running a good hundred metres before flying into the next paddock where he was able to get a second shot into it and it went down. Seventenths, madjon_, tikka and 3 others like this. Here was I thinking that turkeys were only eaten in the months without an 'R'. All the other months, they had worms. Live and learn hey? Good on ya, perseverance has paid off, hope he taste good. The lice were annoying. I could feel them crawling up my arms while plucking them. An exchange student reckoned he couldn't feel anything but later that night he was scratching his head raw! They can be tough to kill. I shot one with a Sierra Blitz from the 223, it did a little jump and kept walking up the hill. Gave it another shot, same response. I was about to give it a third when it fell over and rolled down the hill. The innards were a pulverised mess, it just took the turkey a while to realise it was dead. No lice on this guy, and he had eaten a couple of a crickets but mostly grass, seeds and acorns so we we're going to cook it up and give it a try for dinner tomorrow, will post with the family's reactions for sure. plenty of cranberry sauce or something similar...just in case it is dry. kidmac42 and dannyb like this. You'll only get better and better, it's very satisfying having hunted, prepared and cooked your quarry. Thats a great result! Putting food on the table and respecting the animal is great! That was an enjoyable read. I liked how you looked for your arrow and told the farmer so, and I also liked how you went back and got one. They make fantastic mince, but you do need a few. Brining is key from what I understand. All my turkey goes as salami or sausages. Brining is definitely key with wild turkeys. 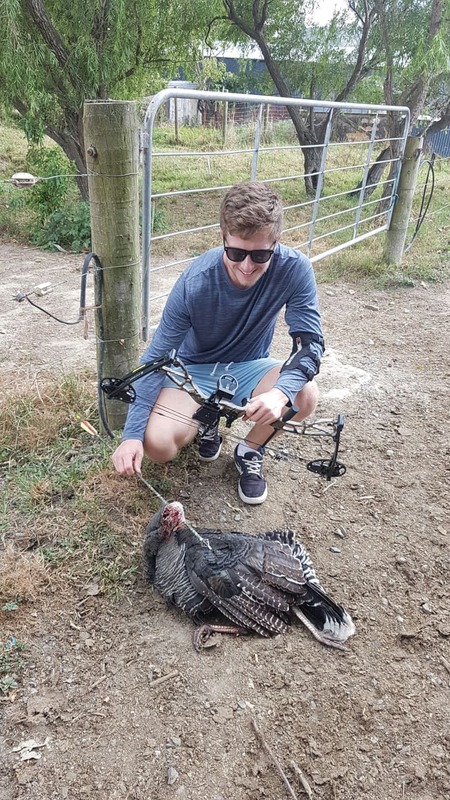 I do a lot of turkey hunting here in the US and I'm assuming the Turkeys in NZ are very similar. I don't pluck any of my turkeys, just bone out the breasts and take the thighs/drumsticks off whole. The drumsticks are only good for soup stock as they have so many bones. The thighs are good in a slow cooker. As for the breasts, if you brine them overnight, rub with your choice of spices(I use salt, fresh ground pepper, paprika, garlic, rosemary, and thyme), then hot smoke or grill to an internal temp of 165F(~74C? ), rest for 10 minutes in foil, then slice. It is great on its own, but will make an awesome turkey sandwich with some good rye bread and cheese. All times are GMT +13. The time now is 07:09 AM.